Editor’s Note: If you are in business for yourself, you better believe you are in sales-selling your services and yourself. 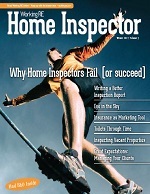 In this piece, Carson-Dunlop, a premier provider of software and training services for home inspectors, offers tips for handling client objections and landing the order. The following are a few approaches to handling objections. One technique for handling virtually any objection is called the feel, felt, found technique. It goes like this: Your prospect (agent, manager, lender, homebuyer, lawyer) indicates that they don’t want to use you because of objection ‘X.’ Your answer is, “I understand why you feel that way. Many of my repeat clients felt that way initially, too, but they found that …” And here’s where you explain some of the benefits that might convince the prospect to proceed. This technique has the benefit of being simple and you can use it for any objection. If you have it at your fingertips, you can pull it out when you hear an objection you were not prepared for. At least you will have ten seconds to think of an answer. A hot button is the one thing that is most important to your prospect. If you can identify your prospect’s hot button, you’re as good as there. For example, a real estate agent may lament to you that all she wants is for home inspectors to be “even keeled.” She doesn’t care what problems are identified during the inspection, as long as the inspector keeps them in perspective. You now have your hot button. During your presentation, you come up with a half dozen ways how you “keep an even keel.” For example, you present instances of your good “bedside manner,” how you help clients keep things in perspective, your down-to-earth style, your balanced approach, and your non-alarmist presentation of house conditions. Forget about all of the other benefits of your service and work the hot button. You can answer objections as they are presented to you. You can figure out what the objections are during the course of the presentation and then bring them up yourself, if the prospect is not entirely forthcoming about them. You can address objections later when you feel the time is right. This is especially important when discussing price, particularly if it comes up early in the conversation. You are better off acknowledging that you understand that price is an important issue and asking the customer if you can come back to it. Offering proof is a good way to diminish someone’s objection. Here’s an example: if you are on the phone with a client who thinks your fee is too high, as we noted earlier, you should agree with the prospect that you are more expensive and ask if you can explain why. Once you have elaborated on the benefits of your service, you can add, “You can see that while we are a bit more expensive than some other inspection/appraisal companies, we offer more value. Furthermore, we are only $25 more expensive than other professional home inspection companies. My three main competitors charge X, Y, and Z.” This last piece of information is the proof. You are offering specific data. Even better, you could fax your competitor’s price schedule. Some people respond well to concrete information like this. A website is a great tool for presenting testimonials. The more credible the testimonial, the more valuable it is. If possible, get permission to use the person’s full name, rather than initials. To add another dimension and make the testimonial even more credible, include a photo of the person offering the testimonial. You will have to ask permission, of course. Copyright 2006 Carson Dunlop & Associates Limited.